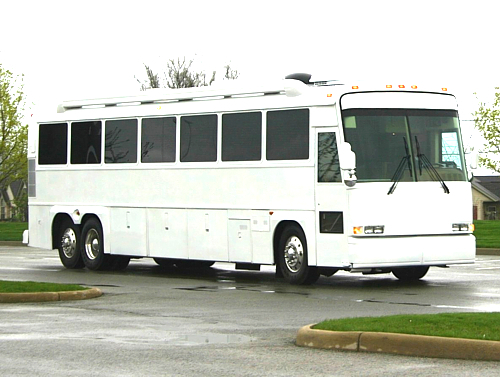 Creative Mobile Interior’s converted a 1988 MCI-102A3 motor coach into an executive corporate day coach. 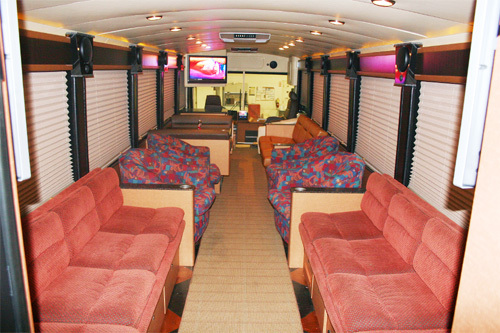 The coach, originally a 48-passenger transit bus, is used by employees of CMI for social outings and to display the company’s craftsmanship. 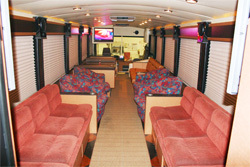 The bus features state-of-the-art amenities and electronics. The visual system includes three Sony Bravia TVs, KVH TracVision Satellite, and a Direct TV HD receiver. 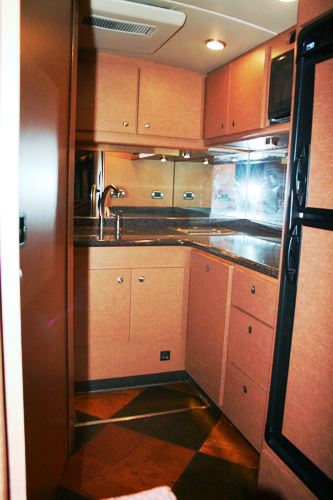 The audio system consists of 22 speakers and tweeters, three sub woofers, an Alpine multimedia system and a two-zone Denon receiver with iPod dock. 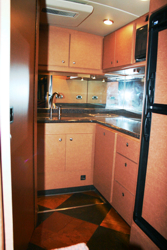 The two systems combined create an incredible sensory experience! 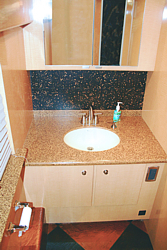 The spacious bathroom features a porcelain Microphor commode, solid surface counter and sink, and a sustainable cork backsplash. 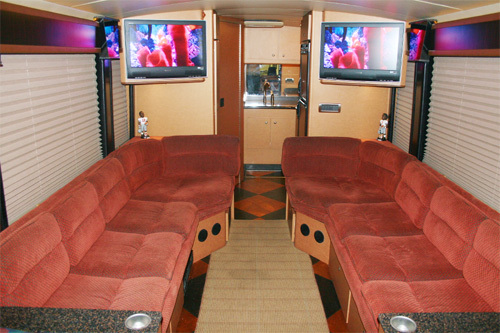 A custom built galley, also in the rear of the bus, has a large 7 cubic feet ac/dc refrigerator/freezer, microwave, ice chest and sink. Alternating copper and dark brass Centiva tiles are placed diagonally throughout the coach providing a rich, luxurious feel. 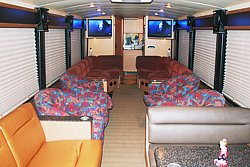 Another innovative electronic feature in the bus is the RTI remote control system which controls all electronics on the bus through a single touch-screen. 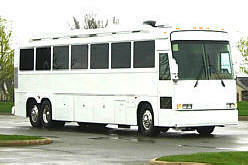 Control the vehicle form anywhere in the coach! 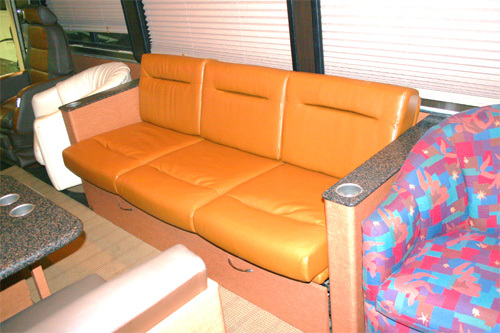 The bus provides seating for 22 including ostrich leather driver and passenger seats, six barrel chairs, two J-lounge sofas, a dinette, and a leather couch. The dinette area has a Corian table and seats for dining, playing cards, and/or conducting business. 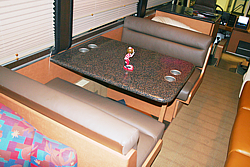 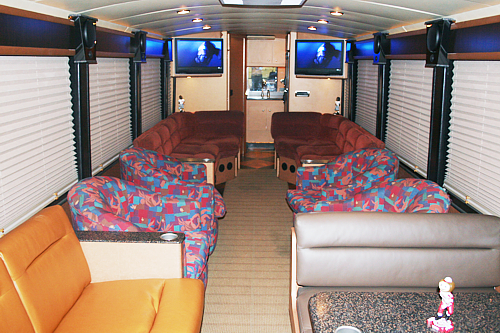 The dinette seats and all the couches can fold out into beds to provide sleeping accommodations for up to six people.